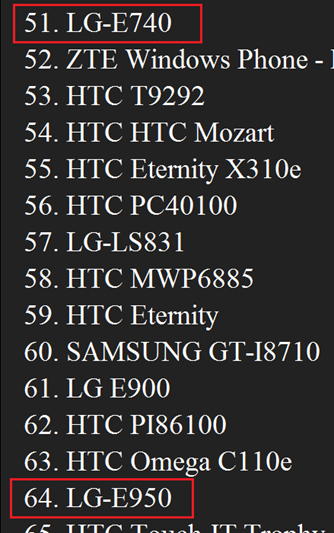 Windows Phone Daily has spotted two new LG devices on the WP Bench statistics page, the E740 and E950. It's worth noting that the LG Optimus 7 is the E900, so we could be in for a Mango version with the E950, much like the Omnia W and Focus S. The E740 on the other hand, we have little to go on. Chances are we could be looking at a device that is built on the previous leaked E700, but a slight upgrade in terms of hardware, or it could be a carrier-specific handset. Whatever the outcome is for either device, it's good to see LG possibly working on future Windows Phones. Let us not forget the Jil Sander E906, which was only recently launched.